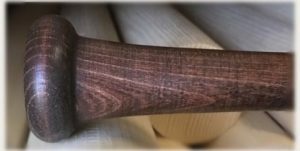 Here at the Ritchie Bat Company, we offer a unique feature in our knob variation option. Every bat you order has the option of 3 different knob variations. 1 – No Flare This option is great if you’re a player that likes to wrap your bat with one of our Ritchie Wraps or another brand such as Lizard Skin. 2 – Traditional This option is what you would find in the traditional cut of must models. This may vary slightly depending on the model you choose. 3 – Flared This option is great for providing a secure feel on the handle but may be too wide for young players.